If you’ve ever made the drive from Kalamazoo to the Kalamazoo Speedway, you’ve likely passed a train car in the middle of Alamo Township where there are no train tracks. When J and I first moved to Kalamazoo in 2009, this train car was a restaurant. They even had a bar underneath it that was open at night after the restaurant closed. 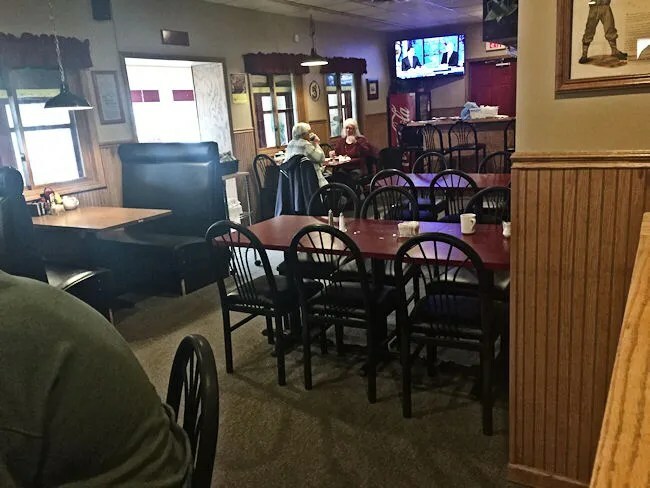 The Club Car Restaurant closed several years back and has sat empty since, so imagine my surprise when Facebook ads started telling me it was open again. Not only was it open, but the food looked amazing and after a couple of co-worker of J’s stopped in there last week and tweeted their meals, we had to find time to get out there. It didn’t take us long. Saturday was a somewhat lazy day, but L has swimming lessons at 10 AM. When she and J got home from lessons, we started discussing lunch. I said why not make the drive out to Alamo and J eagerly agreed. 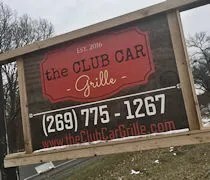 The Club Car Grille is on D Avenue in Alamo Township about just to the east of Ravine Road. 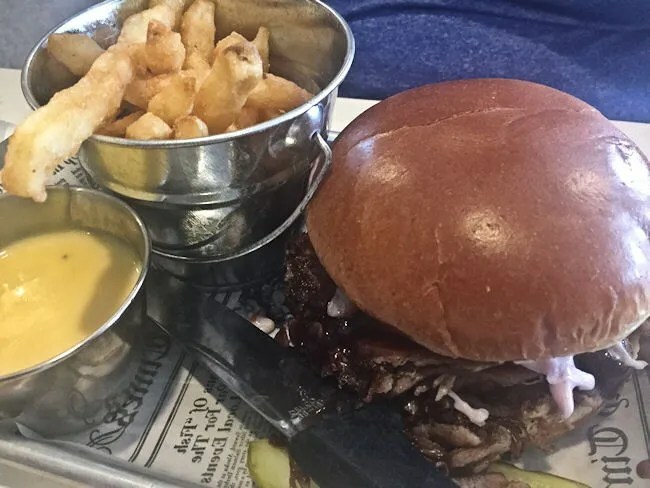 If you get off US-131 and head West, the restaurant is a little less than a mile from the highway on the south side of the road. It’s easy to see right away where the restaurant gets it’s name. A train car is attached to the building and that car is actually used as one of the three dining rooms. They extend that train theme throughout the restaurants with posters, models, statues, and all things train related decorating the space. That train car? A 1910 Pullman. That was a real working train car before it was placed on this spot in Alamo Township. A host met us as we walked in the door and took us to our own private dining room. The place was pretty busy on this Saturday afternoon and it didn’t look like there were a lot of families with small children, so I’m assuming that’s why we were put where we were. It wasn’t a huge deal or something we were mad about. It actually gave us a little more space and a little less to worry about with the kids. Plus, it had it’s own fire place. We didn’t really have to worry too much about the kids anyway. B was in a good mood and they have a play area for kids that L went to right away. 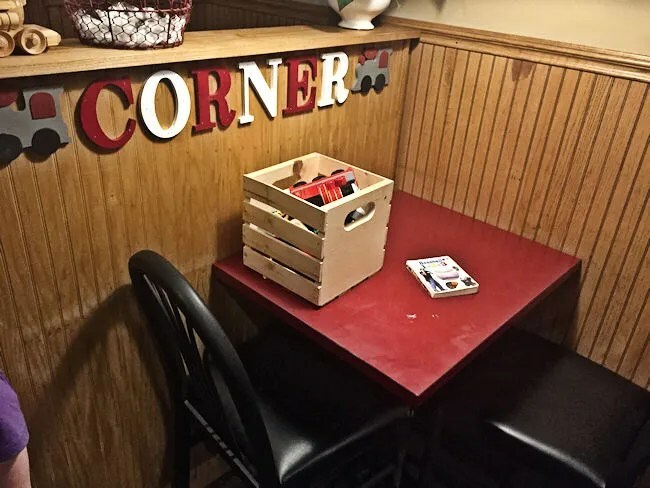 It’s a small area tucked in to a corner by the waitress work area. There’s a table with some toys…including several train toys…. …and a chalkboard. 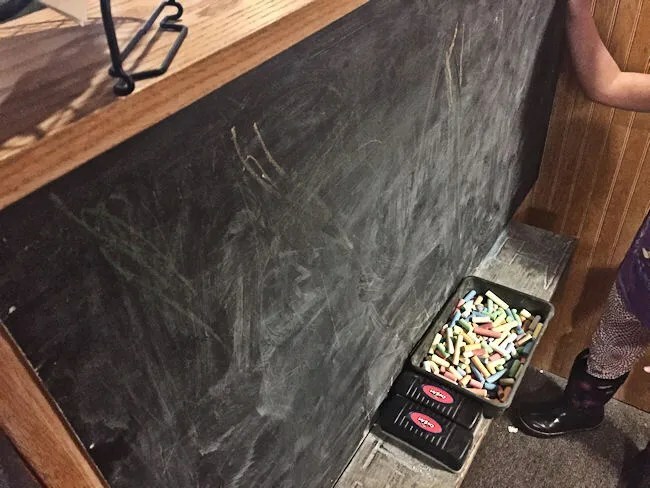 L loved the chalkboard. She pretty much stuck to drawing and coloring with the different colors and since she was the only kid there, she had the whole board to herself. The menu at the Club Car Grille is much fancy than the typical diner and way better than what I remember the last restaurant that was in this space had. 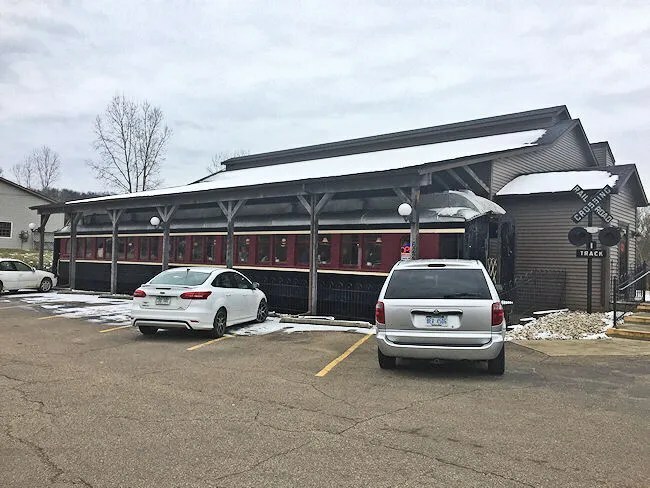 We never ate at the Club Car Restaurant because it just looked like any other generic family restaurant with the exception of the train car. Had we been in the area, it looked like a place we would have stopped at for breakfast but not something we would have went out of our way for. They have a big burger section with several delicious looking creations to choose from. I went with the Brunch. All the burgers are 1/2 lb. prime rib burgers. This one is topped with cheddar cheese, a fried egg, and bacon. It also comes with the usual lettuce, tomato, and onion underneath the patty. This sandwich is just as good as it looks in the picture above. The meat was so tender, so juicy, and slightly salty. The two slices of cheese really made the cheddar flavor stand out and the egg didn’t get lost in a pile of greasiness. 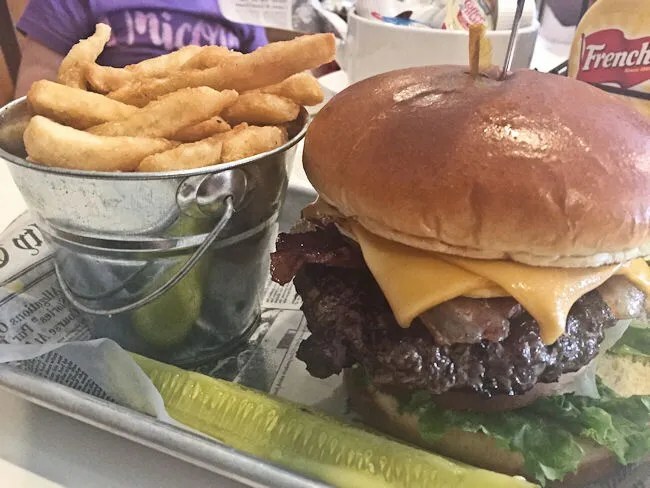 All of the layers of this burger had a distinct flavor to them and all of them were present in every bite. The sandwich came with “Track Fries.” These simple fries are battered and salted. There is an option to get beer cheese for dipping which I passed on. They were good on their own, but, as you’ll see later, are so much better with the beer cheese. J ordered the Hog Daddy. This sandwich is the Club Car’s take on pulled pork. 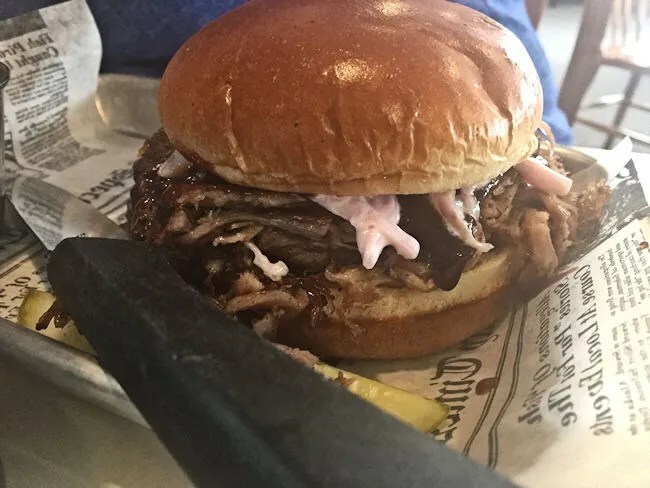 The sandwich is a large portion of roasted, not smoked, pork topped with the house BeerBQ sauce, and cole slaw on a toasted brioche bun. J usually likes pulled pork regardless of how it’s cooked as long as it’s cooked well. I tend to not like roasted pulled pork. I love smoked pork, but roasted pork seems to lack flavor if done poorly. This pork was not done poorly. The meat had a ton of flavor and wasn’t swimming in the barbecue sauce. There was just enough sauce to add the sweetness to the sandwich that J really likes but this pork was tender and very flavorful on it’s own despite the fact it has never seen a smoker. J chose to get the beer cheese with her fries and that was a pretty good move. We both liked the fries as they were , but the beer cheese was so smooth and the warm, melty cheese dripped everywhere as we tried to transfer the fries to our mouths. J gave me a taste, but I didn’t want to take it all since she was the one that ordered it. I will not make that mistake next time. L knew exactly what she want before she sat down. As soon as the waitress came over to take our order, L confidently told the waitress she wanted the Mac & Cheese. 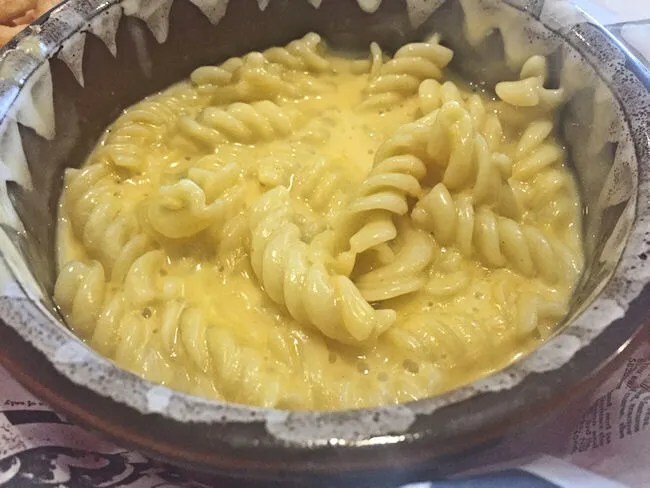 We knew she was hungry because this is a home made mac & cheese with a very, very cheesy sauce. That’s something that usually throws L off, but she dug in to that those noodles right away and didn’t stop until there were only a few left in the bottom of the pan it was served in. I was so happy she left a few noodles so J and I could try it…also, there was so much cheese sauce in the bottom that I sopped it up with some of my fries. Our bill was was a little over $30 before tip. Earlier in this blog I said we never went to the old Club Car because it just looked like an ordinary diner. The Club Car Grille is not an ordinary diner. 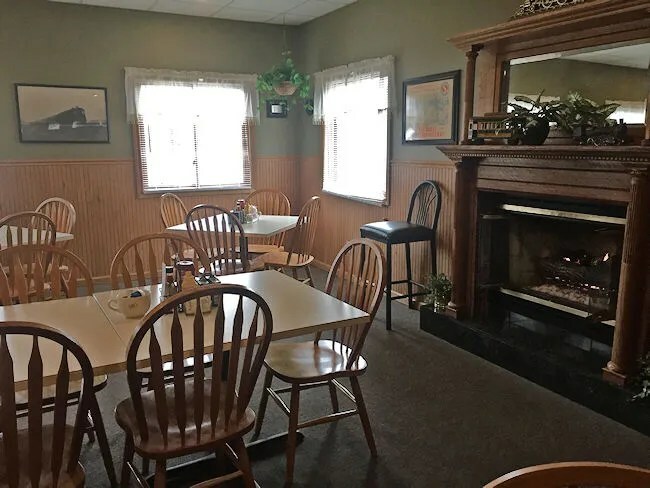 The food at this little spot in the middle of the country is on par with what you would find at a downtown pub but the atmosphere is that down home country diner that is just so comfortable.